The Jolley's Journey: Finally my puppets....A new post!!!! ........IT OUT OF MY FOOT!!!!!!!!!!!!!!!!!!!! 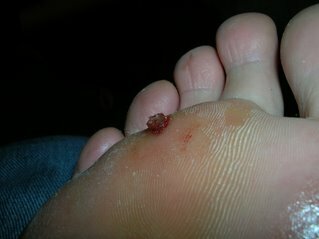 IT BLED ALOT AND THEN CHUNKED UP AS I PUT SUPERGLUE ON IT!!! HERE IT IS THE TODAY!!! A NICE HOLE ISN'T IT.